Drive inland, though, on Beaver Dam Road or via the John J. Williams Highway and you’ll soon encounter a treasure trove of rusty refrigerators, old washing machines, busted fry cookers, and lots of analog televisions that don’t work anymore. I’m talking, of course, about the dump, better known as the Route 5 Transfer Station, which if you don’t know is in Harbeson and part of the Delaware Solid Waste Authority. 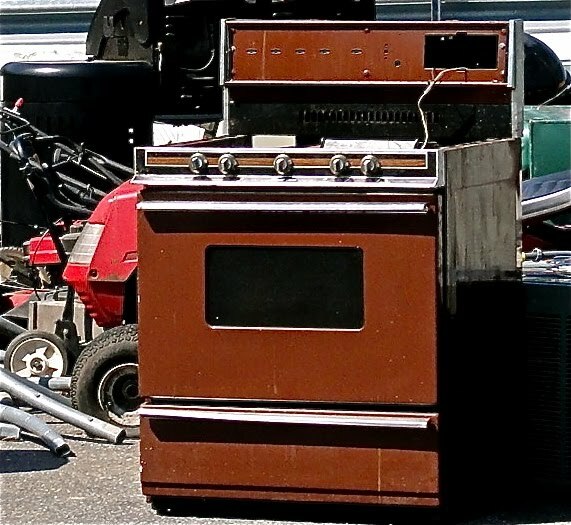 White goods — white trash as it used to be called — is the official name DSWA gives to a whole host of discarded refrigerated and non-refrigerated items like ovens and air conditioners, not all of which are white. Some are avocado green and red. Last year, Sussex Countians got rid of two hundred and three tons of white trash last year. I recently took a Saturday morning drive out to Harbeson to dump some white trash of my own: a set of Martha Stewart wicker furniture that had seen better days and five old Christmas trees. The dump is a fascinating operation, very well-run, clean, and extremely organized. Your adventure starts when you pull up in to the scale house where your vehicle and its contents are weighed. It costs only $7.50 per load up to one hundred and eighty pounds. That’s less than a cocktail and tip at the Blue Moon. Anything above one eighty and less than a ton will cost you eighty dollars – about the same as a round of drinks for you and your buddies at the Blue Moon. What’s with that? Anyhow, I digress. Your second stop at the dump is a small drop-off for household yard waste. There certainly are a lot of Christmas trees in late March. Next you encounter a series of signs and pull-ins for tires, refrigerant goods, and non-refrigerant goods. There are cars and trucks all over the place and it sort of feels like a driving test course. As I attempted to take artsy photos of lawn mowers and appliances for this article, one almost cute DSWA employee kept asking if I needed help. After a half dozen polite declines and shooing off motions, he finally went on his way, turning around every so often to stare. Guess he was making sure I wasn’t preparing to detonate a bomb or abscond with an old Weber grill. A trip to the dump kind of reminds me of going to church. You arrive burdened with stuff and you leave feeling you’ve had an encounter with a supernatural being and everything is going to be okay. It’s very cathartic, this cathedral to crushed dreams and forgotten loves. Attractive too. I’m not kidding. Delaware must have some of the most attractive dumps in the entire country. The Route 5 Transfer station was built to look like a big red barn and to fit in comfortably in the countryside, which it does. In 2007, the station was honored with an award from the American Academy of Environmental Engineers for being an aesthetic facility that is efficient and protects the environment. You’d never know it was a dump. Martha, though, would be proud to know her white trash ended up in such a tasteful facility, don’t you think?